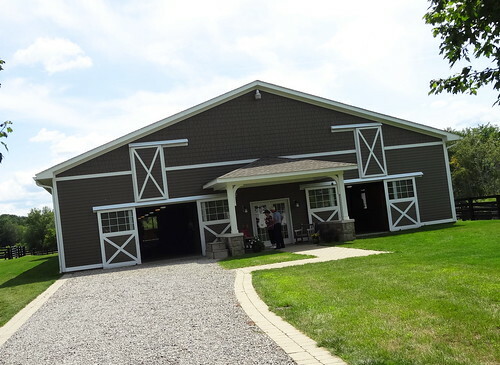 We’re back in Metamora for the 2017 Stable Tour; it’s our third consecutive year attending. 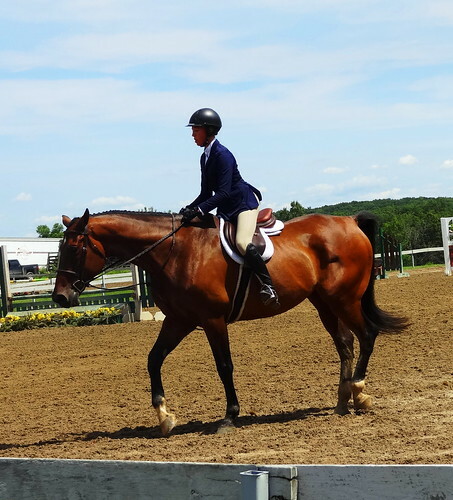 We don’t own horses, don’t know the difference between Western and English or Dressage, the only kind of horse I can identify is a Clydesdale, thanks to the Budweiser commercials that mesmerized me as a child. 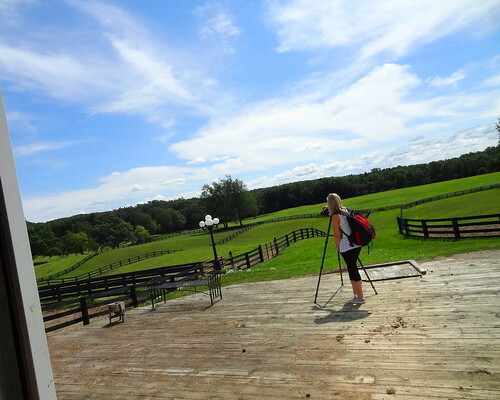 There’s something so beautiful, tranquil, majestic about the horses and the stables, the rolling hills, the generosity of the people who open their private property to strangers. It’s an absolutely wonderful way to spend the afternoon, seeing a different way of life, experiencing something we otherwise wouldn’t. Metamora Hunt Country spans the area bordered by M-24 to the west, Hosner Rd to the east, Sutton Rd to the north and Oakwood Rd to the south. A drive on any of the roads in this area will treat you to scenic natural beauty. 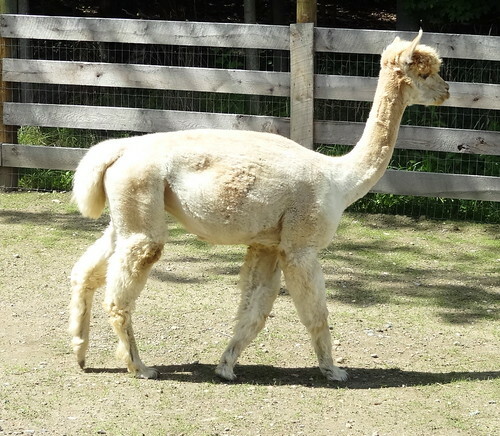 We begin our tour at the Cotton Top Alpaca Farm; Alpacas strut about outdoors showing off for visitors. They seem friendly, even posing for pictures; I like that each one has a different haircut. 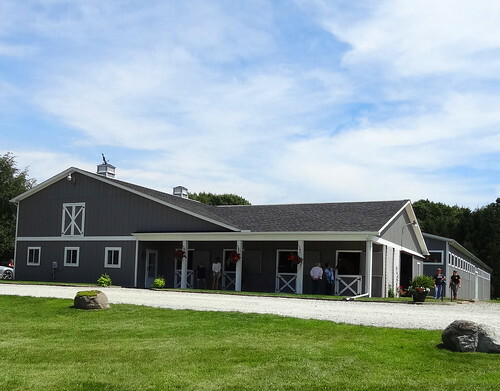 In front of the barn is an antique plow; the barn itself is finished in shades of brown with a splash of red, the building is a unique design for alpacas, the stalls and tack room surround a main open area. Inside we find more of the furry creatures hanging out, the dividers between stalls are low, they can easily chat with their neighbor. At the front of the property is the lovely, 2-story, orange brick residence, from here they have a great view of their land. 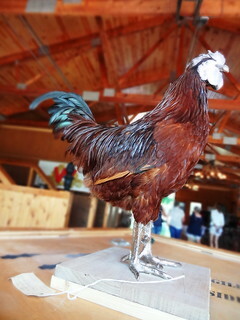 Continuing on, our next stop is Walkabout Farm, established in 1988 its focus is pleasure driving. This is quite a place! 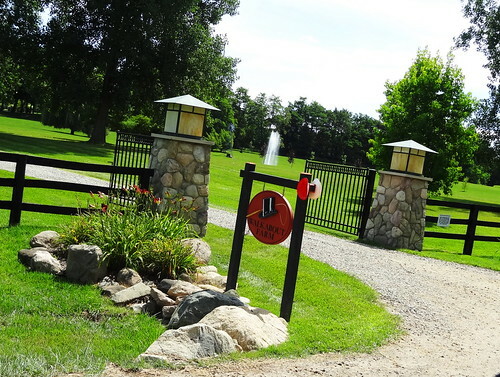 The gate between the stone columns is open, a fountain sprays water high into the air from a pond off to the right, lush green grass spreads out before us as far as we can see. 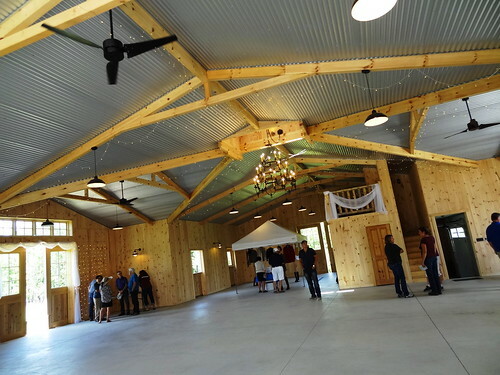 The closest building is a taupe 1-story structure, inside hundreds of ribbons decorate the wood-paneled walls, an antique sled and several carriages are on display, I like the open ceiling with all of the wood trusses exposed and rope chandelier. 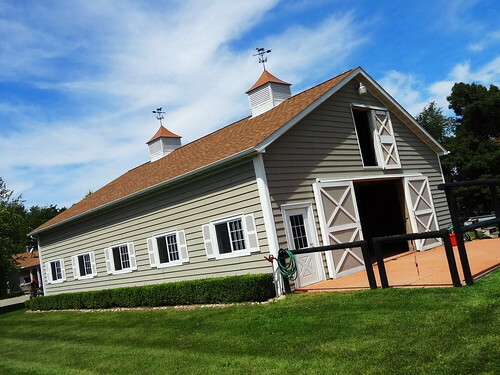 The stable is next, also in taupe with crisp white trim, the interior has a brick paver floor and attractive wood walls and ceiling; it’s such a nice day all the horses are outdoors. The tack room is cozy; all wood with saddles mounted on the wall. 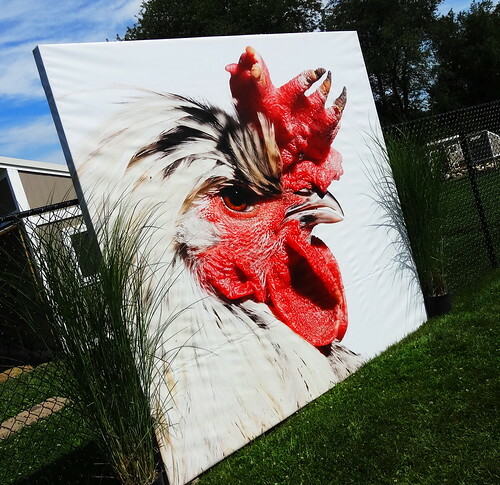 Walking the property I see photos of chickens on large canvases, why do they look so famaliar? Then it comes to me, last Fall Kris and I were at the Wasserman Gallery in Detroit for the Cosmopolitan Chicken Project, that’s where we saw them. 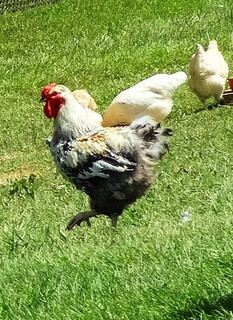 And here they are, black, white, brown, tan, roaming about in their enclosure, their coop matches the rest of the buildings. 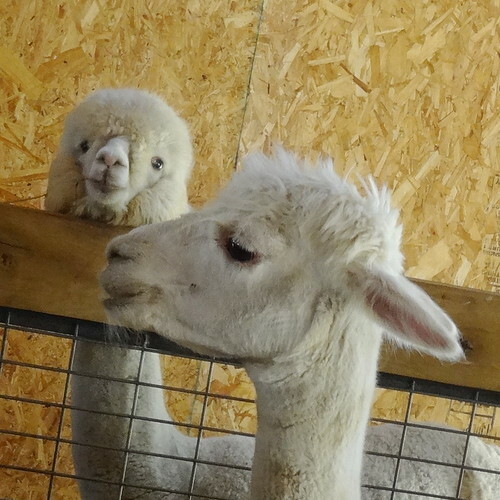 The white one is funny, she’s taking a dirt bath and stirring up quite a cloud of dust. Weeping willows are still, visitors walk the grounds, horses graze seemingly unaware of our presence, I like the one with the white lower legs, looks like he’s wearing socks. 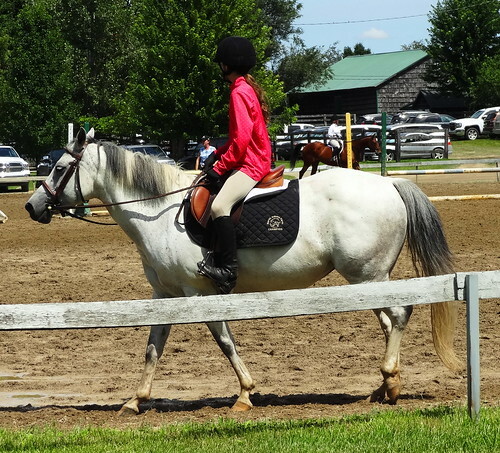 As we drive toward the next stable Kris notices an event taking place; young girls wear black riding boots and helmets. We stop to take a peek. Numbers are fixed to the backs of the competitors, the young ladies look elegant atop their horses, one of the horses has braids. 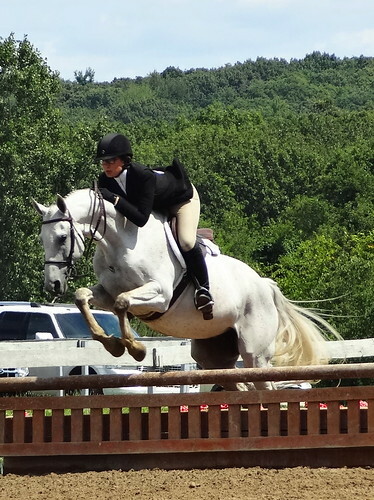 We watch in fascination as one horse after another leaps over fences, the rider almost parallel to the horse. 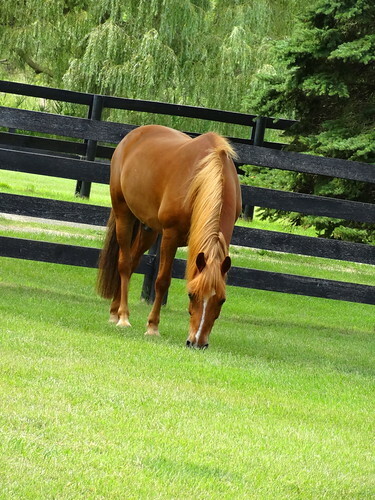 Just another day in horse country. 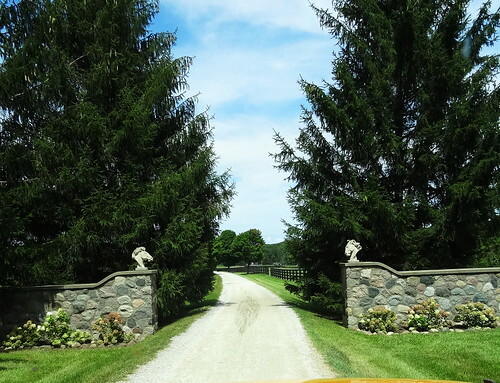 We come upon the next stable on the tour, stone horse heads grace a rock wall, split rail fencing lines the long, long gravel driveway. 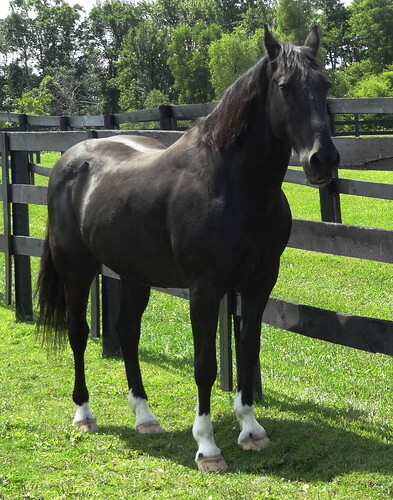 Free Rein Farm encompasses 80 gorgeous acres of land; two German Warmblood horses and Jalisco, an Andalusian stallion from Spain call the place home. The horses seem to be enjoying all the attention from the visitors, they eagerly lower their heads making it easier for me to pet them. 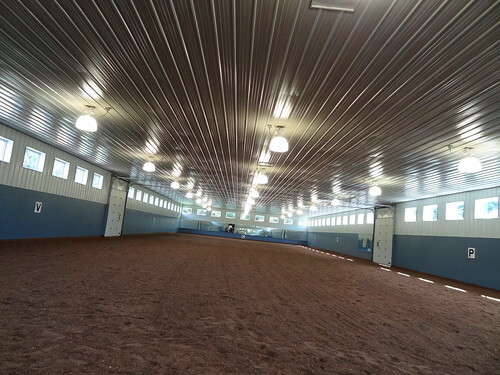 The private dressage barn is empty at the moment, 3 rows of light fixtures illuminate the interior. The owners are the people who bought the White Horse Inn, renovated it and re-opened it in 2014. They’re busy with their next project, renovating the building across from White Horse and opening the Metamora General Store. Looking forward to checking it out when it opens. As we drive through the area on pretty dirt roads we pass another event-in-progress. 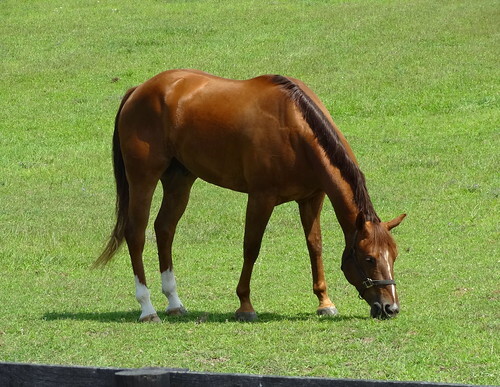 A grassy parking lot is full, a long line of cars are parked along the road, participants walk their horses to the event. We turn into the driveway at New Barn Farm. 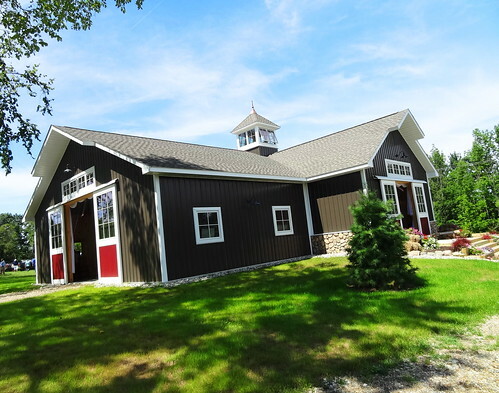 Completed in 2017, the owners built the building for their daughters wedding, it’s now a wedding venue with ornamental gardens and a walking trail to the Flint River. 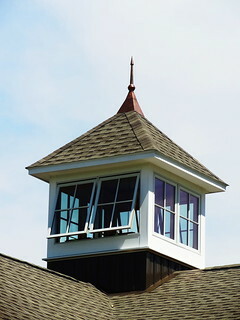 The wood and stone building is quite fetching in dark brown and a splash of red, windows in the cupola are open as are the sliding doors. 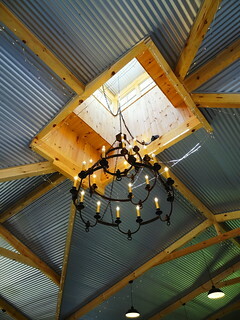 The inside is dazzling; knotty pine with a corrugated metal ceiling, teeny-tiny white lights cascade from ceiling beams, a curtain of lights flanks the doors. White tulle is draped around the balcony and doors, the lone chandelier is simple and graceful. 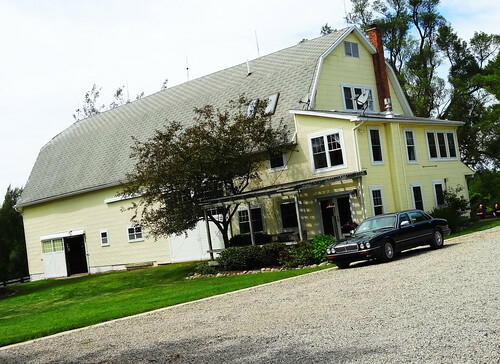 While the original farmstead was established in 1860, Stonebridge Farm and Retreat was purchased in 2014. 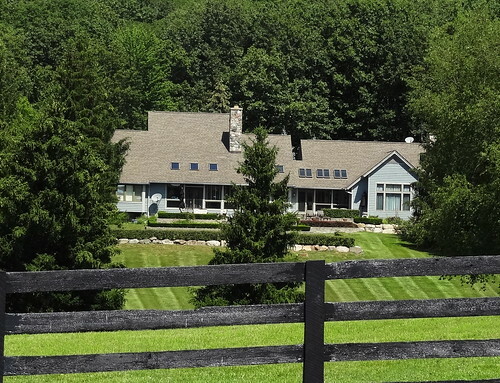 Owners Tim and Heather hope to add a hunting lodge, guest houses and an English and Western Pleasure training facility to the 73 acre property. 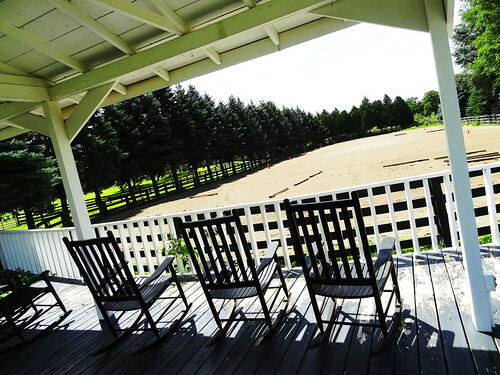 We walk out to the pavilion, antique-looking rockers sit empty, we look out across the landscape, the view is remarkable; land rises and falls gently, black fencing divides the grass into different shapes and sizes. 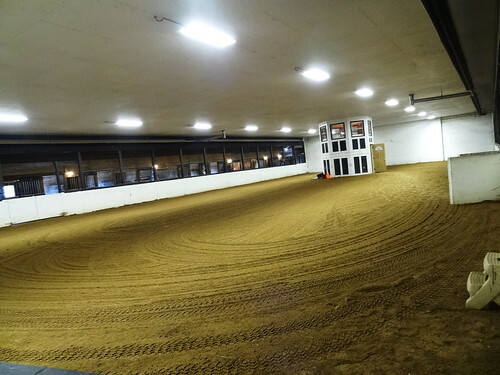 The indoor riding arena looks freshly graded, inside the building we find ourselves back in the 1930’s, transported to Joey’s Stables, the iconic landmark restaurant that stood on W Jefferson in the Delray neighborhood from 1933-1989. 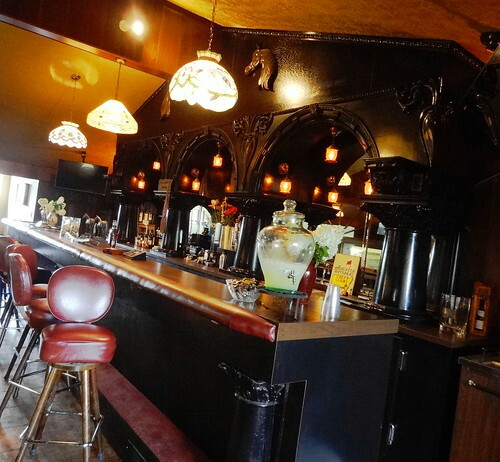 The bar has been completely reassembled, Tiffany lamps glow from above, antique bar stools sit vacant. Just look at the bar, it’s magnificent; ornate carvings, acanthus leaves, the mirror and working sidelights, a work of art. 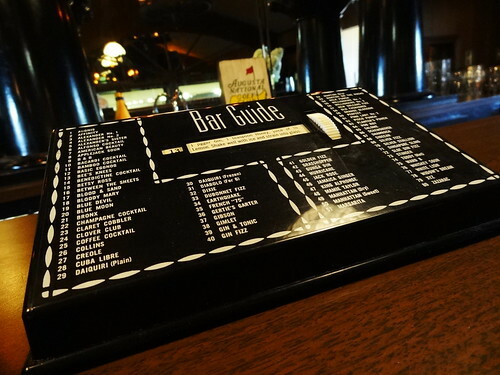 I like the vintage Bar Guide, choose your drink and the recipe is displayed in the little window. What’ll you have? A Gibson, Grasshopper, Stinger, Bees Knees, Rob Roy, French 75 or Kris’s favorite, an Old Fashioned. 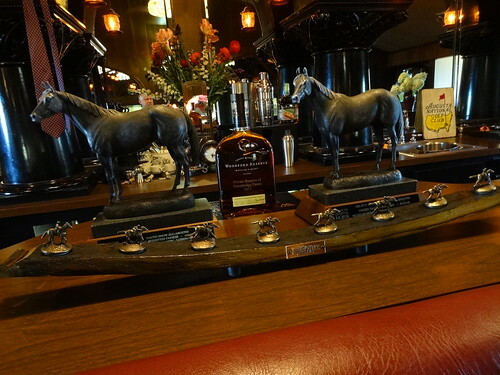 The room is grand, stunning, fantastic, from the copper mugs to the pewter horses to the wagon wheel chandelier. 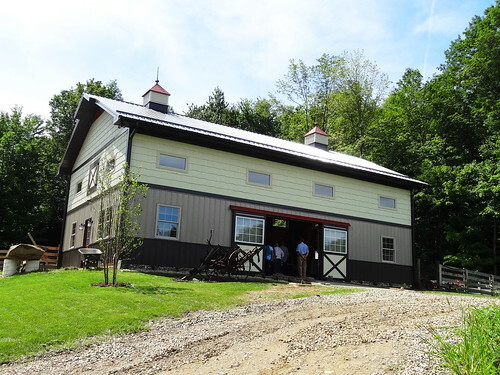 You can sit in the booth and look out over the arena or climb the cupola staircase for a panoramic view of the farm. 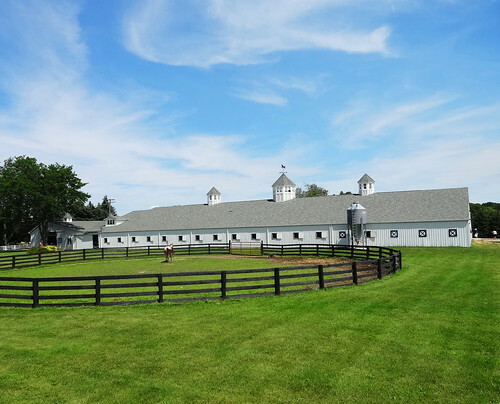 Our last stop on the tour is an 84 acre farm that was once a breeding farm and training facility for race horses. 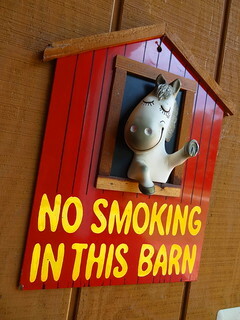 Today Watch Hill Farm is home to Icelandic horses. 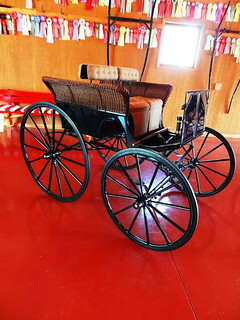 The owners are active in the Metamora Carriage Driving Club. 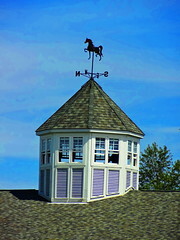 Inside the octagon shaped building are a couple of restored carriages, knotty pine walls and a fireplace make it inviting. 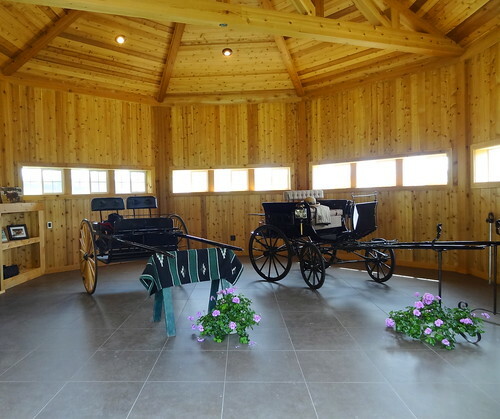 The stables have wood walls and ceilings and concrete floors. The indoor arena is impressive, I’m fond of the exposed wooden trusses; I don’t know what the fluffy-looking stuff is all over the ground but I’d love to take off my shoes and run through it… Outside we find more attractive horses relishing the afternoon sun, down by the water some cows sit leisurely while others munch the green grass. It’s nice being out here, having a little breathing space, taking time out to relax and unwind. 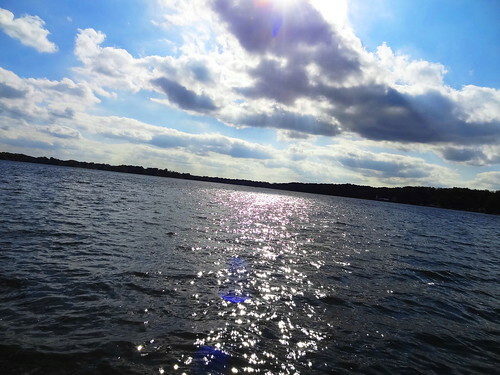 Beauty often inspires peacefulness. 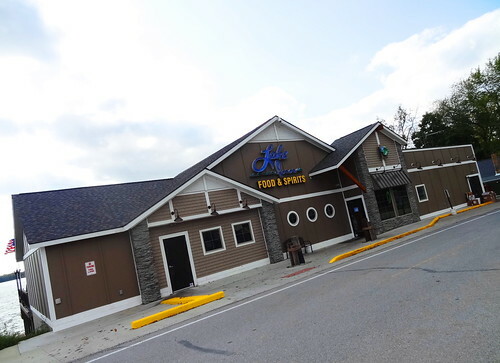 The Lake Inn on Hunt Rd in Lapeer has been family owned and operated for 70+ years, this is our first visit. 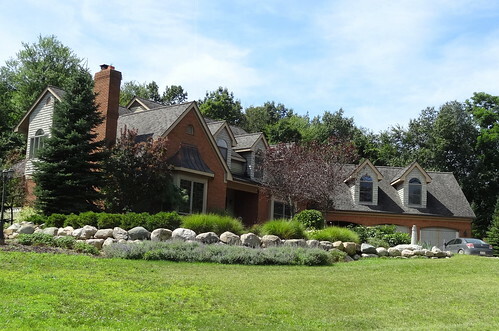 The inside has a bit of an ‘up north’ feel; the main attraction is the unobstructed view of Lake Nepessing. Our corner booth offers us a perfect view of the lake, a waitress greets us immediately with menus and water. After we place our order she quickly returns with my Spartan Stout beer. I’m a big fan of stouts and this is one I haven’t tried. It’s made by Ellison Brewery + Spirits out of East Lansing, it’s absolutely wonderful! I only have half left when our steak sandwich arrives. 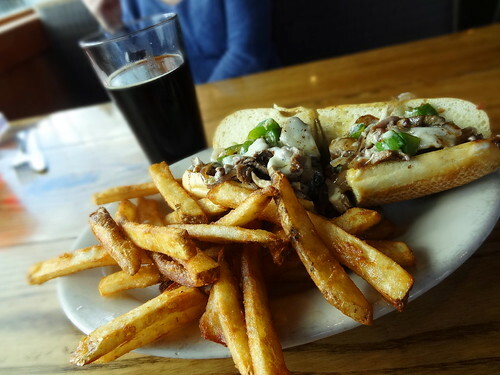 Shaved ribeye with sauteed onions, bell peppers, mushrooms and Swiss cheese stuffed into a hoagie roll, served with thick steak fries; it’s a tasty and satisfying meal. In the summertime tables on the large deck and tiki bar are at a premium, this late in the year there may only be a couple deck-worthy days left. Inside or out it’s a nice place with good food and a great view.